Beyoncé looked stunning in a fitted dress and wavy cropped bob as she partied post-VMAs with Rihanna and Jay-Z. The singer debuted yet another new hairstyle as she hit the Dream Downtown hotel in New York for the VMAs after-party, looking gorgeous in a form-fitting navy dress with sheer side cut-outs, teamed with oversized hoop earrings, ankle strap Brian Atwood heels and a clutch bag. She was joined by hubby Jay-Z, who wore a matching shiny blue button-down topped off with myriad gold chains and Rihanna, who opted for a mini sparkly LBD finished off with a rhinestone choker and black heeled sandals. 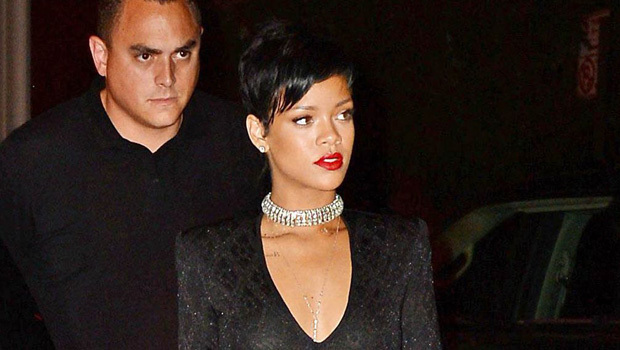 Rihanna’s tiny gold crucifix grill was one of the night’s biggest – and most unexpected – style hits. Queen Bey has been playing hair chameleon for the past few weeks, and earlier this month posted a pic of herself with a pixie crop ‘do to her Instagram account, before rocking an asymmetrical chin-length bob at Virgin Media’s V Festival. Is this new wavy style her best yet?